Sat 22nd October, a day to remember! OSMSB and its Brass class converged on Kings School Ottery St. Mary for a brass band workshop under the internationally renowned band trainer Philip Harper. Philip is a top conductor / arranger / composer and adjudicator, and is known for his association with the championship band Flowers, with whom he enjoyed much success both contesting and on the concert stage. He is a popular choice with westcountry bands and Ottery St. Mary Band were lucky Phil managed to find the time to run the workshop, as he has a very busy schedule, and is in great demand! The day began with 34 players, including a few guests from local bands Honiton and Sidmouth, eager to benefit from Phils guidance. He brought with him a march piece from the pen of the late, great Roy Newsome, entitled National Youth, written for the National Youth Band of Great Britain many years ago and now re printed. The piece was enjoyed by one and all and featured in the concert the band was to perform at the end of the workshop in front of friends and supporters. Other pieces rehearsed were Goff Richards arrangement of the classic I’ll Walk with God, a tuba solo The Bare Necessities, a lively Christmas festive arrangement Joy Peace and Happiness, and Concert Prelude by Philip Sparke. All in all challenging music for the players, whos ages varied from 9 to 82 years ! Philips skillful handling of the band brought out much quality in their playing, developing real improvement in a short time. The Brass class were fortunate to have Philips help in a short, separate session using its own music. One piece that stood out was an arrangment of the Kinks hit Louie Louie. Emphasis was made on how regular home practice would greatly benefit the players, perhaps a chance to escape well known excuses like X Boxes and TV. Tips were also passed on about technique and suitable ways to build up musical skills. 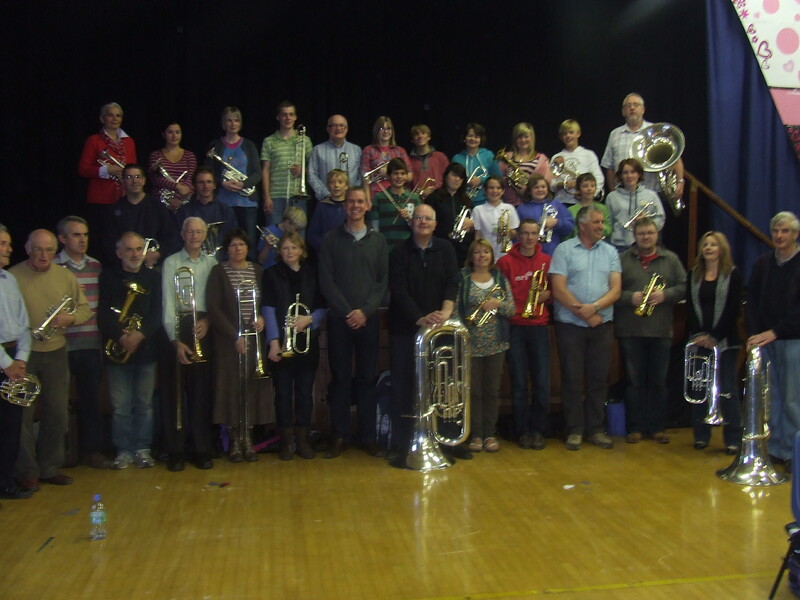 Youth players are vital for the future of the brass bands, and Ottery St. Mary are no exception to supporting this by giving much encouragement to local children. The Brass Class is run by Gail Denning , who with assistant Verity Baker, do an excellent job promoting the wonderful art of making music. For a young person to play a musical instrument and perhaps play a piece people actually recognise, is a joy to behold, and can, with a little guidance and help, launch a lifetime of musical enjoyment., and long may it continue. Throughout the day refreshments were laid on by band members, providing snacks and a well earned cuppa. between sessions. The final concert was well recieved, particularly a piece which featured a few junior members providing percussive backing ( on maracas, tambourine,cow bells and various other rattling items and even bunches of keys! ) The audience were later heard to remark on the quality of the playing, ending a very enjoyable day.